The Task Force intends for this report to be a living document for Charlotte-Mecklenburg as we, individually and collectively, take bold action in the months and years ahead. We offer 21 strategies, 86 recommendations, and over 100 tactics as a starting point, acknowledging we don’t have all the answers, and others may disagree with our findings. However, we believe our report can serve as a catalyst for engaging our community in a deeper conversation and continued investigation of the best paths forward. Whether you represent a house of faith, an employer, government, a civic organization, philanthropy or just an individual who wants to make a difference, we need you. In particular, we need the voices of people facing barriers to opportunity represented in public conversations about their future. Our hope is that everyone can find a place to connect with this work and help make a difference. Solicit feedback from the community, as well as public and private sector representatives in business, philanthropy, faith, healthcare, education, etc. Refine the report recommendations as necessary. Set high-level goals, priorities, and expectations with respect to the interrelated determinants. Analyze how each decision contributes to desegregating our community racially, ethnically, and economically. Identify the cost of implementing key priorities and develop a funding strategy to execute these priorities. Establish a continuous improvement model for the work. Advocate for system and policy changes. Convene and connect various Mecklenburg County sectors and initiatives and identify opportunities to align with state and national initiatives. Develop state policy agendas with other communities for larger impact and support. Promote a strong opportunity culture for Charlotte-Mecklenburg and build community will. Implement sustainability strategies to support the board/council’s infrastructure and an accountability strategy to inform the community of progress. Adapt the model of Read Charlotte with a dedicated staff, advisory boards, and working groups aligned with determinants and cross-cutting factors. At a minimum, we recommend that staff to support this work should include a project director, assistant director, communications specialist, and data specialist, plus funding for initial data collection, seed funding, and awareness campaigns. We recommend on an interim basis, the work be supported by staff from Foundation For The Carolinas and United Way of Central Carolinas. During this interim phase, the board/council, through engagement with the community, should determine the most effective long-term structure and financing model. The diagram adjacent to this paragraph shows what an implementation structure might look like. Above all else, ensure diverse voices and perspectives from across the community are meaningfully engaged throughout the process and included on the board/council to provide guidance and support. Use a systems-thinking approach to address the determinants holistically. Systems thinking will enable us to better understand and attend to the connections and interconnectedness across the determinants and the community systems that influence and impact children, youth, and family outcomes, such as social services, criminal justice, education, health, housing, etc. It will also help avoid unintended consequences when making decisions across multiple systems. The early systems thinking efforts of Read Charlotte offer a local example of how this approach can work. Incorporate targeted universalism, as recommended by dr. john a. powell. This concept will help us identify universal goals for all children and families, but tailor and target our solutions or interventions dependent upon the differing needs and challenges of sub-populations and where they are situated in the community. Consider place-based initiatives to improve outcomes for children, youth and families. The place-based framework helps better support a community’s response to challenges by focusing on solutions that tackle multiple problems and create transformation within specific neighborhoods or communities where needs may be greatest or unique. Ensure existing programs and services related to our recommendations are research informed and/or evidence-based to determine which are creating the most opportunities. Systems thinking can help us with this ambitious task. We cannot afford to continue doing the same old things in the same old ways. We also need to identify where bottlenecks exist within our current systems of services and support that create barriers to access and where greater coordination and collaboration can make a difference. Seek opportunities to align and leverage investments of government, philanthropic organizations, and others funding community programs and initiatives. Achieving the level of change we envision requires new approaches and risk-taking. 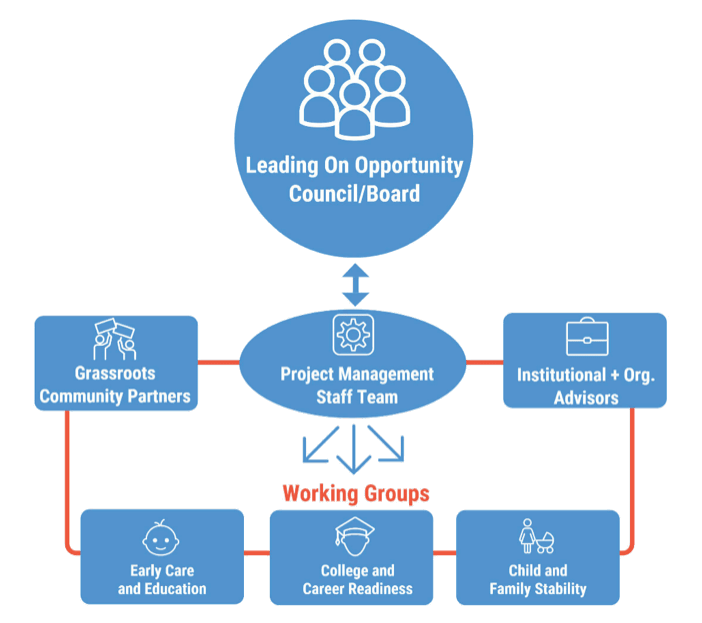 Through collective impact and aligned investments, funders can embrace opportunities in a circle of support. For an opportunity dashboard to be used as a tool for measuring our community’s progress, we will need to identify which of the indicators are most important to measure and track over time and develop specific targets for them that we are collectively moving toward. This dashboard will help our community recognize success over time. The work begins today. Some organizations have swiftly committed to align their work around economic opportunity, and others are waiting for our report to help them decide how they can best play a role within their unique missions. These organizational commitments reflect an “opportunity movement” that is underway in our community and that we anticipate will grow. Join the Leading on Opportunity campaign online. Updates on progress and opportunities for engagement will be continuously posted on our website (www.leadingonopportunity.org) and social media accounts. The Leading on Opportunity campaign will succeed only through ongoing participation and feedback. Review this report, or some aspect of it that interests you most, and discuss with your friends, family, colleagues and community connections. Take a step further by discussing this report with people whose perspectives may be different from yours. If you are a government official, elected or otherwise, look at the decisions you are making around budgeting, policies and other actions to see how you are contributing to the opportunity story. Leaders from the City of Charlotte and Mecklenburg County have already committed to use an opportunity lens in decision making. Let the conversation about opportunity seep into the divisions within government so those closest to the work can identify improvements. We also encourage staff and elected officials from across the public sector to engage in conversations with each other to find ways to coordinate policies, funding, and service delivery. If you are a philanthropist or foundation, review your charitable investments to ensure you are working toward the highest possible human gain and you are collaborating with other public and private funders. You can ask new questions of your grantees to make certain your visions of success are aligned and more importantly, achievable with the level of funding that you provide. We also call on philanthropy to drive funding toward organizations with demonstrated effectiveness and/or organizations that are committed to learning and improving to better meet the challenges ahead. As you consider things like impact and effectiveness, ask if you are providing the resources to help organizations measure their outcomes. Finally, we ask you to consider the possible unintended consequences of a major shift toward “opportunity” on organizations, causes, and issues that may fall outside the scope of our report. As we noted in the beginning of our report, our work was narrowly tailored to address a specific community challenge: intergenerational poverty. Other areas of need continue to be worthy of philanthropic support. If you are nonprofit organization, begin looking at your practices and policies to see how you are serving your clients/customers and the true impact you are having in creating opportunities for children, youth, and families in our community. Are you thinking about the needs of people holistically and partnering well with other organizations and systems? How are you defining success? Are you providing an impact beyond what would have happened without your program’s support? Is your board inclusive of the voices from the community you serve? Are your board members informed and holding the organization accountable? Are you engaged in a deliberate process of empowering and fostering leadership in the communities you serve. If you are a neighborhood leader, look at ways to connect your neighbors internally within your community and also externally with people and resources to build a stronger and more mutually supportive neighborhood. If your neighborhood is strong and resource-rich, how might your neighborhood collectively partner with other neighborhoods, schools, and organizations to lift up all children and families? If you are an individual, begin thinking about the people and networks in your life that have connected you to opportunities over the years. How might you step outside your comfort zone and develop relationships with children, youth and families in our community who could use some support, not in a charitable, paternalistic way, but as a genuine connector to ideas, networks, and opportunities? For any entity or individual interested in knowing how we became such a segregated community with such wide disparities, explore resources like the Levine Museum of the New South; take the Community Building Initiative’s (CBI) Bus Tour; attend the Race Matters for Juvenile Justice Dismantling Racism experience; or participate in the Crisis Assistance Ministry’s Poverty Simulation. Additional resources are available on this website www.leadingonopportunity.org.<... are a handful of early suggestions for how people and organizations can begin to engage immediately. We want to hear what you are doing and hope you will share your stories on social media. As the opportunity structure falls into place over the next several months, additional and more detailed ways to engage will be developed with input from community members. This is one of those “all hands on deck” times when everyone is needed. On behalf of all Task Force members, it was an honor to serve and provide recommendations on how to improve economic opportunity for all children, youth, and families in Charlotte-Mecklenburg. We have all been changed by our experience studying our community’s greatest assets and challenges, and by having honest conversations about the circumstances that people living in our community face. We embrace your review of the recommendations, and hope community members will offer new perspectives and suggestions for revision and improvement. These are Our Children. This is Their Future. Let this represent Our Commitment.